Lime/Lemon Flavored Salted Apricot by HOLA Saladulces Lobito. 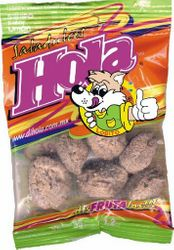 Saladulces Hola are dried lemon flavored apricots that have a sweet and sour taste that is so irresistible you won't able to have just one. Its a fun snack that has a unique tangy taste and the right amount of sweetness to satisfy your tastebuds. What's even better is that these snacks can be eaten anywhere and have many health benefits since they are known to have several antioxidants and are a natural diuretic. What are you waiting for? Grab a bag of Saladulces and enjoy its sweet and sour taste with an ice cold beer. Ingredients: apricot, water, iodized salt, citric acid and artificial flavoring. 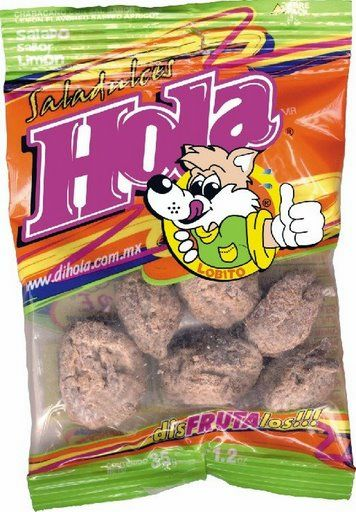 Saladitos de Chabacano con sabor a Limon marca HOLA Lobito, importados de Mexico. Saladulces Hola son chabacanos secos con sabor a limon. Su sabor agridulce es tan irresistible que no podras comer solo uno, pues es una golosina divertida con un sabor unico que satisfacera tu paladar. Lo mejor de todo es que puedes comer esta botana en cualquier parte y tiene muchos beneficios para tu salud ya que son conocidos por tener antioxidantes y ser un diuretico natural. Que estas esperando? Toma una bolsa de Saladulces y disfruta su agridulce sabor con una cerveza helada. Ingredientes: chabacano, agua purificada, sal yodatada, acido citrico y saborizante artificial. I really enjoyed them....got delivered on time and fresh as ever. I wish they would sell bigger bags though. I would definitely order more. I got some saladitos and they were so good. On time. Really like this company. Will order again. This is a good snack for me. the are very good when you eat them with a orange you get the sweet and sour taste. This is the best brand of saladitos. I couldn't find them east of texas. Thanks mexgrocer. These are super flavorful with just the right amount of salt and sour flavor. The plums were not overly dry and were a generous size. This product was great! Almost as good as the ones I used to eat as a child!